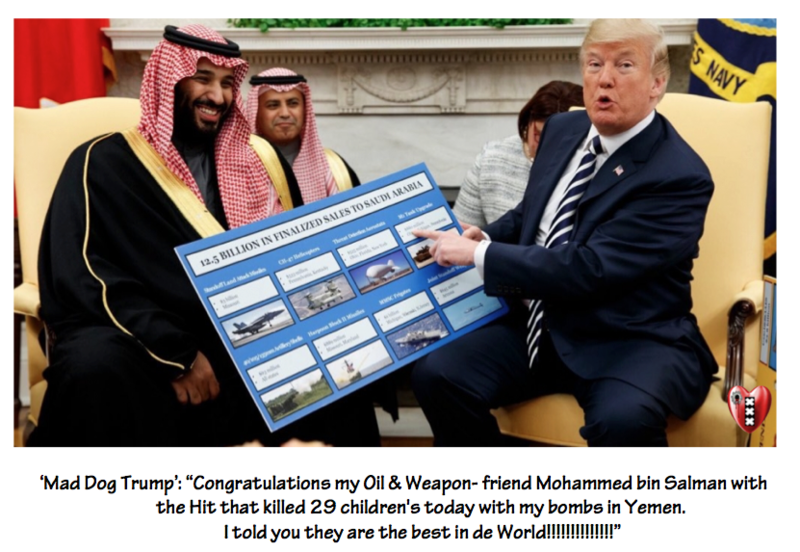 De Bommen van May & Trump met ‘Saoedi-Arabië Airstrike’ vermoordde vandaag 29 kinderen. Geen News voor de MSM. Brought to the brink of collapse’. The Saada attack took place less than a week after an airstrike launched by the ‘UK&US-Saudi-led coalition’ killed dozens near a hospital in the city of Hodeidah. Mirella Hodeib from the ICRC told RT that the group is calling for the protection of civilian infrastructure.“The humanitarian situation in the country is catastrophic, the population has been brought to the brink of collapse. The movement of the population is growing because of [the ongoing] conflicts and hostilities,” Hodeib admitted. She noted that the Yemeni healthcare system has been “decimated,” while infrastructure is “weakened” and “would collapse across the country.”According to the ICRC representative, humanitarian organizations can neither feed millions of Yemenis, nor provide access to healthcare for them. “Twenty million Yemeni people are in need of [humanitarian] aid. The ICRC has always called upon all parties of the conflict to [find] a political solution… in order to curb worsening humanitarian conditions,” she added.The ‘US&UK-Saudi-led coalition’ has been waging a brutal military campaign in Yemen since March 2015, in an attempt to restore president Hadi to power. Three years of ‘UK&US-Saudi-led ‘bombardment and a blockade of Yemen has led to a catastrophic situation in the country, with 22 million people, or 80 percent of the population, in need of humanitarian aid, while more than half of the country is left without basic medical services. Human rights organisations have been accusing the coalition of indiscriminate shelling of civilians and infrastructure.The war in Yemen has killed almost 10,000 people in three years, and is what the United Nations has labelled as the world’s worst humanitarian crisis. Where are the muslims protesting for Yemen? Israel kills Palestinians. Muslims protest. 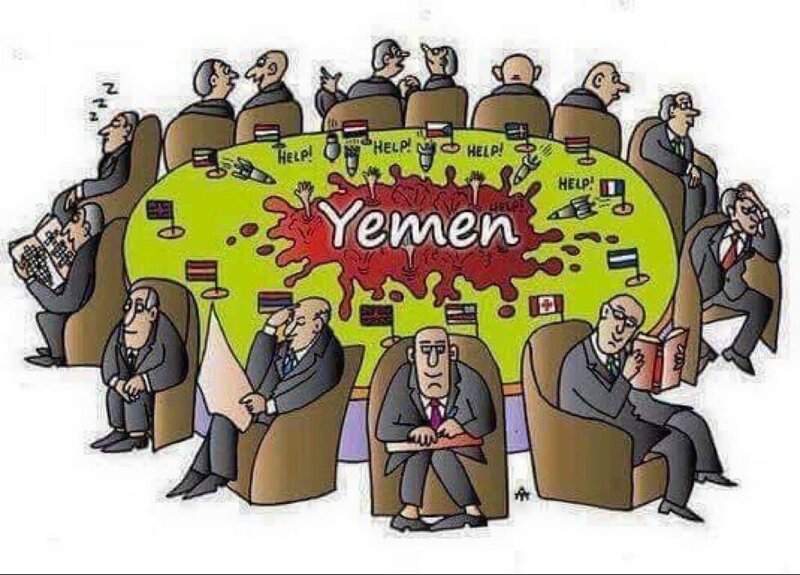 Saudis-Emirates&UK&US butcher Yemenis. No demonstration. ‘Mad Dog Trump’ valt Rusland aan met ‘War-act-sancties’ despite there being zero evidence Moscow was behind the attack. ‘Gelukzoeker-Munie’ & VVD-Burgemeester Krikke waren al ontmaskerd als Mega Fraudeurs door Volksnieuws & Stem v.d. Straat/Salto TV. Zo overduidelijk Trump acteert, des te heimelijk waren de heimelijke acties van zijn voorgangers? John de Mol vindt Wilfred Genee ‘lekkere knul ‘ als presentator . Genee zei dat hij in principe weg moest bij rtl omdat VI lage kijkcijfers had ,en bij veronica zullen ze nog lager zijn.